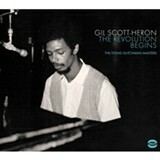 To elegize the late Gil Scott-Heron would be to do a disservice to his art. That art — its singular voice and collective narrative — gets the reissue treatment on The Revolution Begins: The Flying Dutchman Masters, a three-album collection of all the recordings Scott-Heron and pianist Brian Jackson did for Flying Dutchman Records in 1970 and 1971. These early recordings — previously released as low-quality filler tracks to accompany Scott-Heron's most famous song, "The Revolution Will Not Be Televised" — contain so much more than the spoken-word style critics have credited as the precursor to rap. When Scott-Heron first started working on them, he was a poet, but with Jackson's accompaniment, he became a musician. The jazz, R&B, and soul sounds that were prevalent in the Seventies dominate the piano- and conga-driven rhythms on The Revolution Begins. Every note accents Scott-Heron's poetry and vocals, the latter being one of the more surprising aspects of the collection: Scott-Heron couldn't sing as well as Marvin Gaye or Al Green, but his warm baritone comforts even as it's delivering bleak lyrics about being black in white America. The second disc is devoted to Scott-Heron's spoken-word performances, the only music being sparse percussion. And the third disc is a mix of alternative takes of both songs and spoken word.